Manchester United and Paris St-Germain have been charged by Uefa following their Champions League last-16 tie at Old Trafford on Tuesday. United have been charged with the throwing of objects by fans and blocking of stairways. 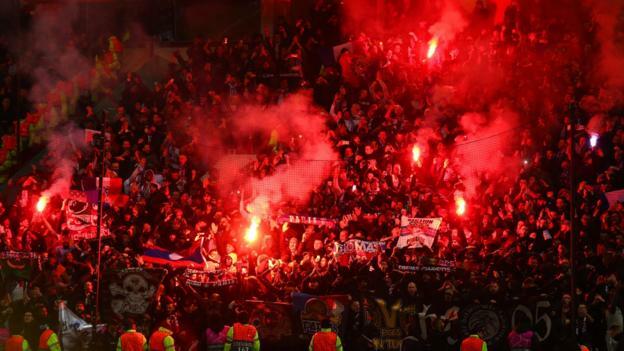 PSG have been charged with the setting off of fireworks, throwing of objects, acts of damages and crowd disturbance. French champions PSG won the first leg 2-0 with second-half goals from Presnel Kimpembe and Kylian Mbappe. The case will be heard by Uefa’s control, ethics and disciplinary body on 28 February. Former Manchester United forward Angel di Maria had a bottle of water thrown towards him during the second half.